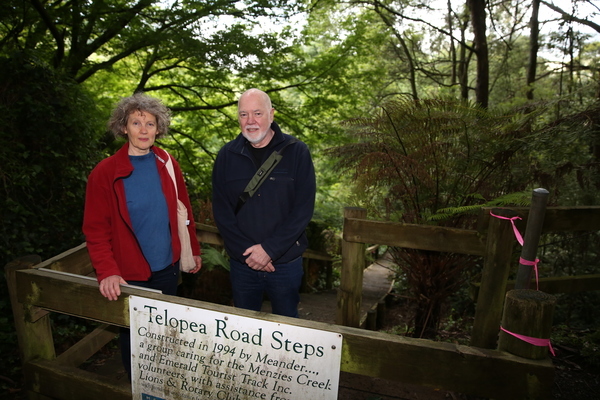 Meander president Kate Forster and Meander engineer Claude Cullino at the Telopea Steps in Emerald. Meander has raised concerns about the state of the Telopea Steps, which will be used in the upcoming Oxfam Trailwalker event. The group cares for the Menzies Creek and Emerald Tourist Track, and co-ordinator Kate Forster told the Mail that the locally famous Telopea Road had become a tripping hazard. She said there was rusty and torn wire. The group was vital in creating the steps and helped lead construction with the help of Emerald Lions, Rotary and SES groups 24 years ago. Meander said Cardinia Shire Council recently discovered a private title for what it thought was its road reserve, and therefore liability insurance might not exist if someone had an accident there. Ms Forster said that considering the council and Parks Victoria had given verbal approval for the 3000-plus participant, 100 kilometre Oxfam Trailwalker event to travel through the area and use this route, the safety of the steps needed to be addressed. “Local volunteers have done an incredible job to get the wonderful stream reserves across our region better protected with the new Yellingbo Conservation Area,” she said. “Yet Trailwalker doesn’t comply with the protection given. 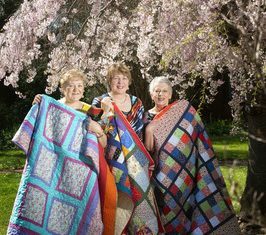 The group has urged Cardinia to resolve the issue and close the area until the steps could be made safe. “Wire netting meant to provide grip is rusted, broken and lifting, but this can’t be replaced as Cardinia Shire Council has discovered a private title for what had been considered a road reserve,” Ms Forster said. Cardinia responded to the claims by stating that “this is not a council asset, and as a result, council has not been responsible for its maintenance”. Parks Victoria’ metropolitan parks regional director, Craig Stubbings, said that since working with Meander in 1993 “Parks Victoria has, in good faith, managed the walking track, including the Telopea Steps”. He said that Parks Victoria was made aware of a small section of the steps which was not public land. “In late October, Parks Victoria was made aware that a small, 50 metre section of the Telopea Steps was not part of its public land management footprint,” Mr Stubbings said. “In response, Parks Victoria is working closely with the Department of Environment, Land Water and Planning (DELWP) and Cardinia council to resolve the status of the land and confirm ongoing management responsibilities.